Musica is a national South African, music and entertainment retail chain with roots back to 1963. For years Musica was for many South Africans their primary source of non-broadcast entertainment. However the digital download and streaming era forced the retailer to reposition their retail offering to find new relevance in the digital era. The resurgence of vinyl in the local music market combined with the trends towards the use of raw natural materials in in-store equipment provided the theme for Musica’s 2014 in-store experience refresh. Many of the new equipment items featured raw plywood finishes adding a natural tactile experience in strong contrast to the previous plastic and powder-coated metal equipment. This aligned well with the “analogue experience” offered by pressed vinyl records and sought to recreate the record store record browsing experience from previous eras. The store refresh sought to provide a space where customers would happily spend time browsing through the vinyl record merchandise thereby recreating the concept of the music store as a lunchtime and weekend destination. The vinyl record customer represented an important new customer category in the future in-store shopper mix—although in reality just a return to their roots after years of CD and DVD focus. An additional opportunity for renewed in-store focus was the emergence of the trend of headphones as fashion items. For years earphones had been shrinking and becoming ever more discrete with one of the primary focus areas being the water-resistant gym and fitness market. However almost overnight conspicuous headphone sets became a bold fashion statement, almost a required fashion accessory on the heads and around the necks of previously inaccessible youth customers. Musica sought to reposition themselves as ‘the retail destination’ for fashionable headphone accessories thereby reclaiming old customers lost to digital downloads as well as possibly winning a set of new customers. 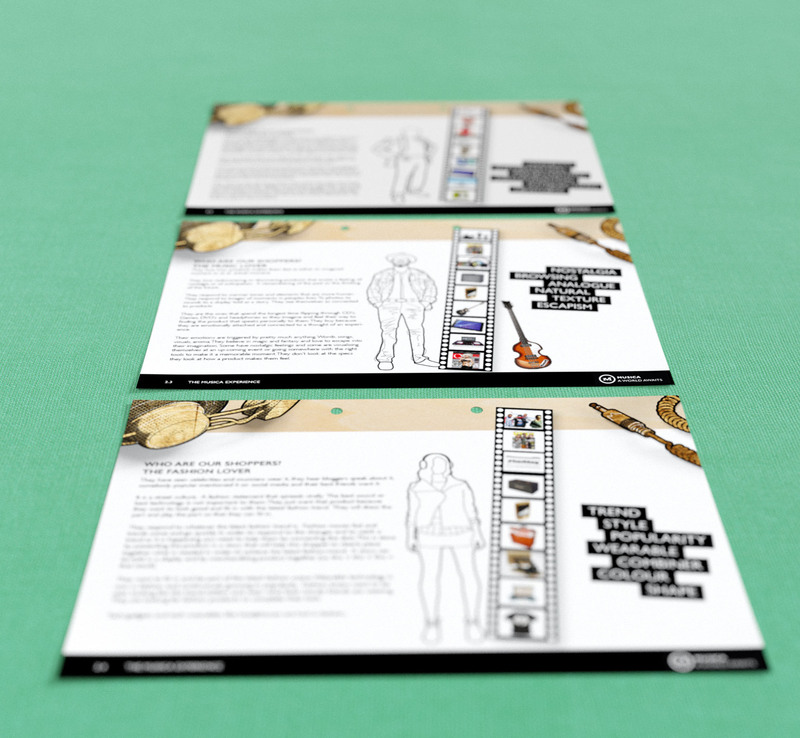 Musica approached us to help them communicate this change in focus with a themed in-store style guide. 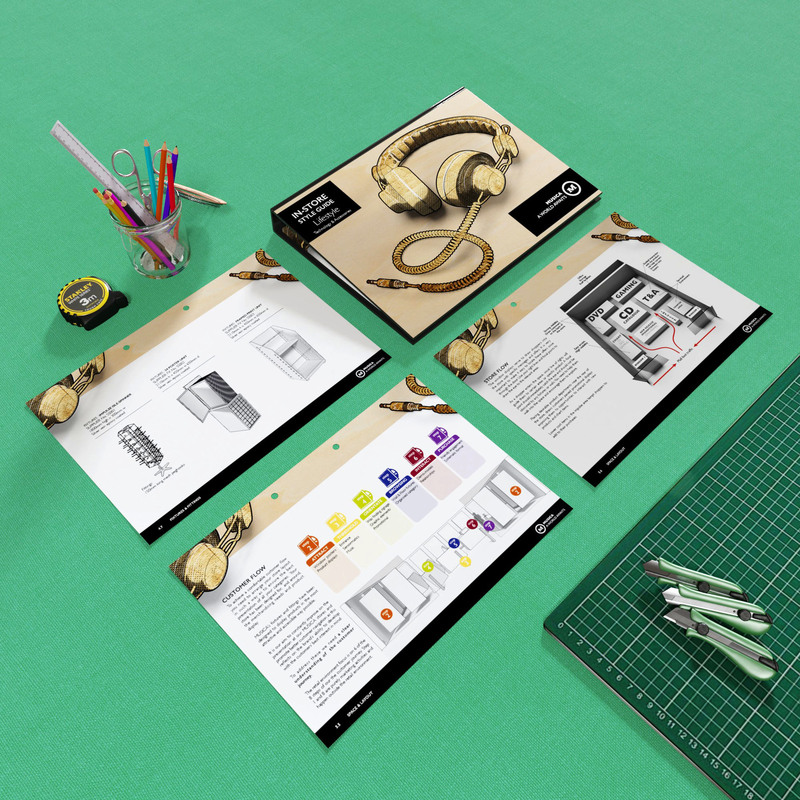 This guide needed to be both a visual inspiration for the new look as well as a practical guide to the new store layouts and strategies, while explaining who the new shoppers where and detailing their shopping preferences. 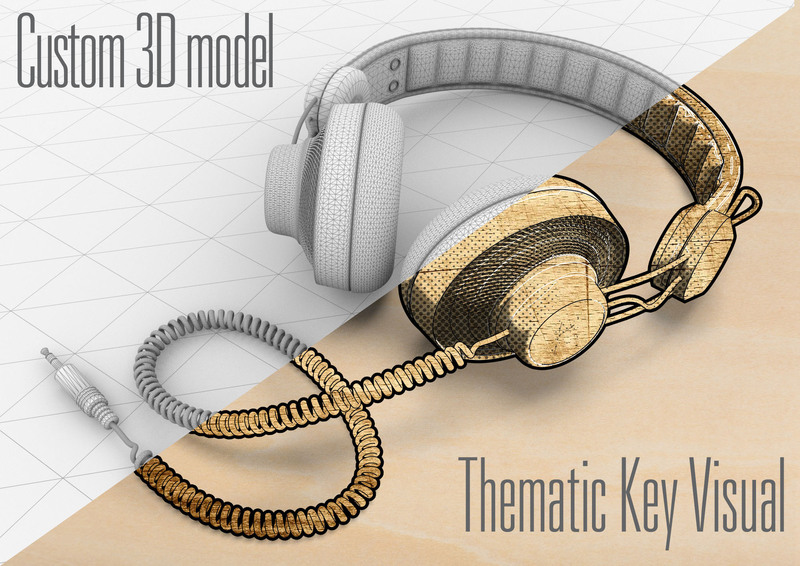 The “wooden” headphone key visual we created became the centre point of the communication as it touched on all the key concepts of raw natural materials, analogue experiences, love of music and a blend of technology with nostalgia.